Manhae was born in northern Gyeongsang province in what is today South Korea. Prior to being ordained, he was involved in resistance to Japanese influence in the country, which culminated in the Japanese occupation from 1905 to 1945. The same year the occupation began, 1905, Manhae was ordained as a Buddhist monk at Baekdam Temple on Mt. Seorak. 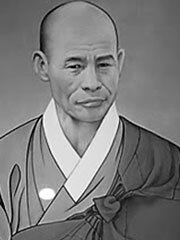 As a social writer, Manhae called for the reform of Korean Buddhism. Manhae’s poetry dealt with both nationalism and sexual love. One of his more political collections was Nimui Chimmuk (님의 침묵), published in 1926. These works revolve around the ideas of equality and freedom, and helped inspire the tendencies toward passive resistance and non-violence in the Korean independence movement.